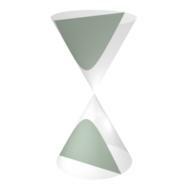 Hyperbola: A conic section formed by intersecting a plane with both halves of a right conic. where a is the semi-minor axis parallel to the x-axis, b is the semi-major axis parallel to the y-axis, and the point (h,k) is the center of the hyperbola. Why does the hyperbola disappear when a or b is zero? Manipulative 1 - Hyperbola Created with GeoGebra. The foci for a hyperbola are the points at for a hyperbola with an east/west opening and for a hyperbola with a north/south opening. In manipulative 1, click on the check box marked 'Show directrices'. 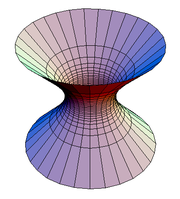 Click on the blue point on the hyperbola and drag it. Notice that the ratio remains constant for a particular hyperbola. Figure 2: Flashlight hyperbola. Click on the image to see a larger version. A flashlight makes a cone of light. 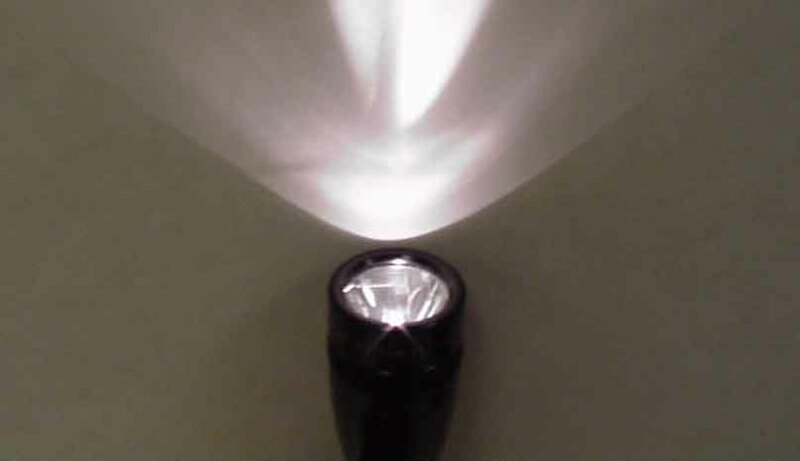 If a flashlight is held close to a wall and parallel to the wall, the plane of the wall 'cuts' the cone at in such a way that the 'edges' of the light form a hyperbola. A liquid in a small tube is drawn up the tube by a action known as capillary action. The liquid forms a hyperbolic curve. For more information see capillary action in The Internet Encyclopedia of Science. The path of an object in space relative to a much larger object can be a hyperbola. The path of the object is a hyperbolic trajectory if the speed of the smaller object relative to the larger object is more than escape velocity. In actuality, very few hyperbolic trajectories are observed in nature. This is because an object on a hyperbolic trajectory 'breaks free' of the gravitational field of the larger object (in this case the sun). Because it breaks free, the object does not return close to the larger object so is rarely observed. Figure 4: Hyperboloid of one sheet. A hyperboloid is a 3-dimensional figure created by rotating a hyperbola about a line. Figures 4 and 5 show two types of hyperboloids. Figure 5: Hyperboloid of two sheets. McAdams, David E.. Conic Section . allmathwords.org. Life is a Story Problem LLC. 3/12/2009. McAdams, David E. Hyperbola . 3/17/2019. All Math Words Encyclopedia. Life is a Story Problem LLC. http://www.allmathwords.org/en/h/hyperbola.html. Hyperboloid of One Sheet: Svdmolen, https://en.wikipedia.org. Licensed under the terms of the GNU Free Documentation License, Version 1.2 or any later version. https://en.wikipedia.org/wiki/File:HyperboloidOfOneSheet.png. 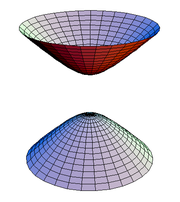 Hyperboloid of Two Sheets: Svdmolen, https://en.wikipedia.org. Licensed under the terms of the GNU Free Documentation License, Version 1.2 or any later version. Flashlight Making a Hyperbola: Dave Clauson. Used with permission. Do not copy.